The anti-environment activists are impatient with Donald Trump because he hasn't yet managed to destroy all the trees and cover the USA in tar, cement and smog. 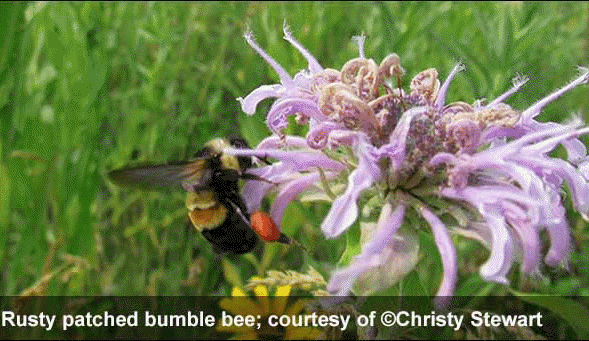 Paul Driessen thinks that Donald Trump and his administration dropped the ball by not killing off the Rusty Patched Bumble Bee before it could be declared endangered - or something. It seems that there are some people who care about this bee, which is native to north America. Some government authorities don't want to see it disappear, which is incomprehensible to Paul Driessen of CFACT. Yes, according to Paul, this endangered bee is going to all but stop any and all tarring and cementing of the USA in its tracks. He's outraged that the efforts to make the rusty patched bumble bee extinct have hit a set back. Paul Driessen and CFACT should be grateful that Trump's actions means that this little at-risk bee won't stop bad coal companies from polluting streams and waterways. Nor will it stop car manufacturers from polluting the air and keeping the cost of running vehicles high - presumably just the way Paul Driessen wants to keep it (for his oil company mates). Paul has indicated in the past how he hopes to bring back smog. Here's a little native bee that's on the verge of extinction, and here's Paul Driessen apoplectic that efforts to save this small creature will slow down the destruction of nature in the USA. Most, but not all, people at WUWT want to get rid of all life species except humans, apparently so ignorant that they don't know that we humans cannot survive without other species. Walter Sobchak expresses that view. He wants to kill everyone who likes the natural world. The only species that needs to be destroyed is the “environmentalists”. Eternal truth: Government is not the solution – government is the problem. Drain the swamp! charles nelson is sticking up for the humble bumble bee and seems to be claiming to be a member of the Environmental Movement with capital letters, presumably the breakaway group that wants the world to burn and nature to be destroyed along with it. Just because someone is skeptical about CAGW doesn’t necessarily mean they are happy about wanton destruction of species, habitats or environments. I think that the greatest crime perpetrated by the Warmists was that they discredited and split the real Environmental Movement. There will be cults, governments even, which will exact capital punishment for chopping any tree.